A timeline of key periods in British history, plus information about ancient Egypt, Greece and Rome. Watch video histories about key figures and events in British history. Hop in a time machine and travel through 5000 years of art at Metkids, the Metropolitan Museum of Art's website for kids in New York City. Explore the history of telescopes, from Galileo to NASA's observatories. 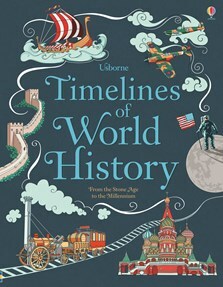 There are many excellent world history books on the market, [but] this one is quite unique in its scope and presentation. Highly recommended for children.